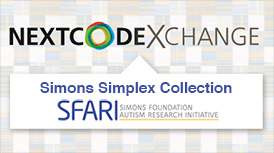 THE NEXTCODE Exchange is hosting the Simons Simplex Collection (SSC), a global resource for research on autism spectrum disorders comprising genomic data from nearly 2,800 families. Autism research is underway around the world to better understand the genetic basis for the disease, which is difficult to diagnose and has limited treatment options. With vast amounts of data being generated, the answers to this challenging disease may lie in the consolidation of this global data. The newly launched NextCODE Exchange (read the release here) may be a critical solution in changing how autism is diagnosed and treated. The Exchange is hosting the Simons Simplex Collection (SSC), a global resource for research on autism spectrum disorders comprising genomic data from nearly 2,800 families. With the Exchange, the SSC will be accessible to the world’s autism researchers to harmonize the growing body of relevant genomic data. By enabling the rapid analysis of massive amounts of sequencing data followed by instant collaboration and validation of findings, the availability of the SSC and other hosted data will accelerate the pace of discovery in this field. This simple concept is likely to help usher in a new era of genomic medicine, offering global access to data that can answer questions to some of today’s most challenging diseases. Learn more about the NextCODE Exchange and the Simons Simplex Collection here. 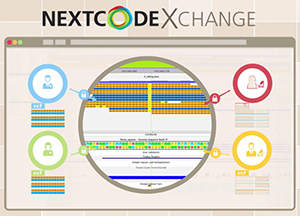 The newly launched NextCODE Exchange provides a browser-based hub for multi-center sharing and collaboration on collective data from massive whole-genome databases like the Haplotype Reference Consortium (HRC). The American Society of Human Genetics (ASHG) meeting convened this week in San Diego, bringing together genetics experts from around the world to discuss programs with great potential to advance genomic-based medicine in the years to come. To maintain the momentum generated this week, we need to find ways to integrate these important ideas, insights and programs, and to maximize the use of the massive databases that have been launched to support research on cancer, rare diseases and other pressing health topics. One of the databases unveiled during the meeting was the Haplotype Reference Consortium, which aims to become the world’s most comprehensive database of genetic variations. Large databases like the HRC, along with several others already underway, can be tremendously helpful to researchers finding answers to some of the most challenging diseases. But there remains a significant bottleneck: these large, cumbersome databases cannot easily be shared and manipulated, limiting their utility for broad, multi-center genomic research. The solution lies in the newly launched NextCODE Exchange (see release here). This browser-based hub allows for the sharing and harmonizing of massive whole-genome databases like the HRC to accelerate research. The integrated architecture allows users to visually confirm and validate findings in raw sequences, collaborating and sharing with others around the world who may have complementary research underway. The momentum generated during ASHG will be multiplied by sharing and learning from the world’s collective genomic data on the NextCODE Exchange. Learn more here. The NextCODE Exchange, a new browser-based hub, allows for real-time sharing of whole genome collections in a simple, consistent format. The field of genomic medicine is rapidly advancing as the research community becomes more comfortable manipulating genomic data with the goal of discovering insights about disease causes and risks. Yet each database is hosted within separate organizations, organized in unique ways and vastly too cumbersome to easily share with others who may be working on similar research. This weekend a new tool launched to enable just that. 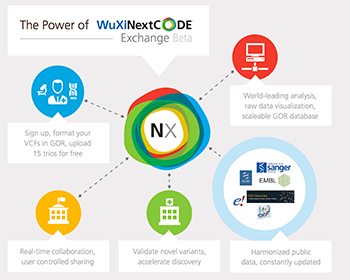 The NextCODE Exchange (see release here), a new browser-based hub, allows for real-time sharing of whole genome collections in a simple, consistent format. The availability of this Exchange is a critical advance in extending the utility of genomic data by allowing organizations around the world to access and harmonize large complementary datasets, potentially multiplying their study data sets to gain more reliable insights than ever before. 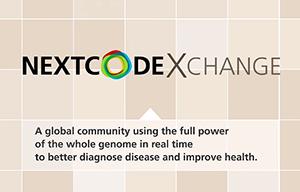 Already, numerous organizations are participating in the NextCODE Exchange to add and share their genomic data, including clinicians and researchers affiliated with Boston Children’s Hospital, University College Dublin, Queensland Institute of Medical Research (Australia), and Saitama Medical University (Japan). As new institutions look to the Exchange to share genomic data, this hub holds significant potential to help advance progress in genomic-based medicine. Learn more about the NextCODE Exchange here.